How much will you owe Arizona at the end of the year? Remember to factor in what you’ve already paid through withholding and similar programs. DECIDE HOW MUCH YOU CAN DONATE. The program maximums (the maximum amounts for which you can take a credit in a given tax year) are $800 for married filing jointly and $400 for single filers. You can carry unused credit forward for up to five years. (Unused credit is anything you donated up to the maximum that you couldn't actually use, most often due to a lower-than-expected tax liability.) Anything beyond the maximum is considered a charitable contribution! We accept donations by credit card (online) or check (download form). All online donors will receive a receipt immediately via email, and all donations made by mail will be processed within two weeks. 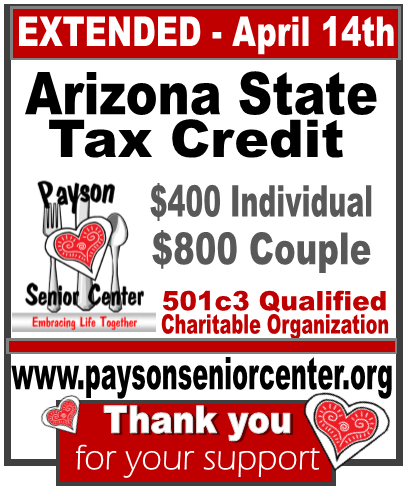 In order to claim the tax credit for your donation, you must file Arizona tax forms 301 and 323 along with your Arizona income tax forms. (QCO: 20507) If you make an Overflow/PLUS/Switcher donation, you must also file Arizona tax form 348. These forms (and instructions) can be downloaded here. Please consult a tax adviser with further questions.